This delicate design is tougher than it looks, featuring pearls, flowers, and lace. 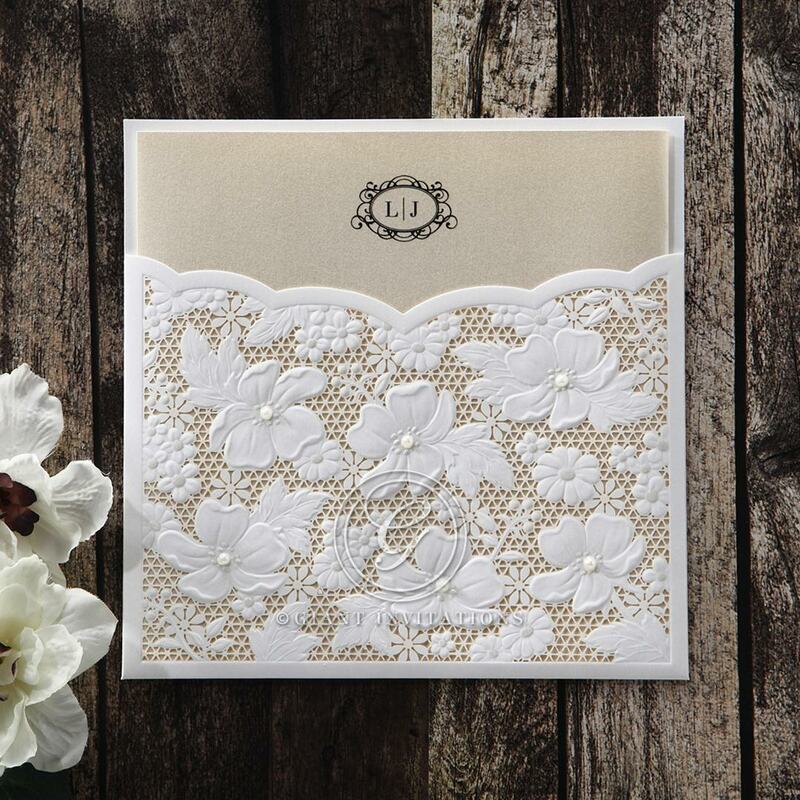 This V-top pocket card is richly detailed with tiny seed pearls placed as the center of each bloom. 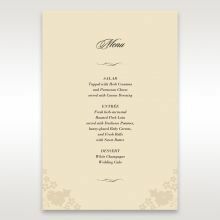 This part of the invitation is White Pearl cardstock with silk foil. 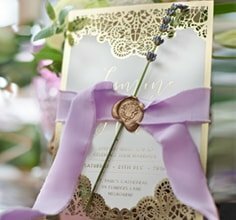 The wedding details are printed in raised ink on Gold Pearl paper that slides nicely into the lace pocket. The text, fonts, and layout are all customisable. This product is imported, and the country of origin is printed on the back. 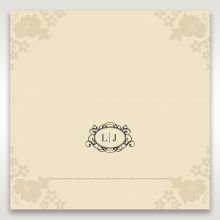 The coordinated Stationery set features a matching watermark of the delicate floral design. Offered by Giant Invitations. These invitations are absolutely amazing! They look great online but even more perfect in person. The lace and the little pearls look divine on the outside of them and they look just as good inside too. 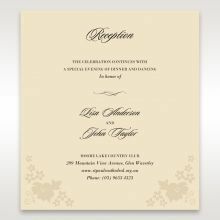 The completion time for my invites was very quick and I also have to mention how fantastic the customer service was all throughout my ordering process so a huge thank you to everyone at Giant Invitations! One extremely satisfied customer right here. Love, Ivana. 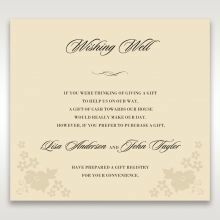 I ordered this card, along with some other samples, to mainly see the quality of the cards by giant invitations. All the samples were of very high quality and so it was very hard to choose! 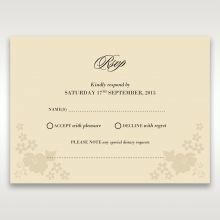 Giant invitations has very nice and unique designs compared to all other websites that I've seen. 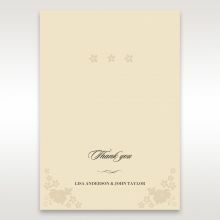 This particular card looks very delicate and elegant. Another really good thing was that it arrived very quickly! Most other places take weeks. Very happy I've finally found my wedding card! 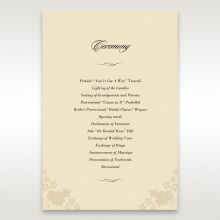 I ordered this invitation as a sample and was so surprised at the quality. It arrived super quickly which helped me determine that Giant Invitations was where I wanted to purchase from. I can't believe the price difference from the other websites I was looking at, and the range of features offered is still fantastic. Very happy with the design and overall outcome of my invitations through Giant Invitations. Highly recommended for their excellent customer service and attention to detail. 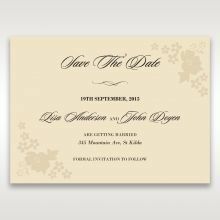 The quality of the wedding invitations of the precious pearl pocket style was amazing. I am so happy that I found this website after a recommendation. When I ordered the samples I was impressed, and then went to order the real thing! 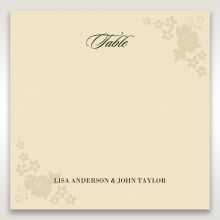 the prices are competitive and giant invitations even include quality stickers and envelopes with the order which are usually charged from other companies. I am very impressed! I had been looking at so many sites with no luck for good quality or service. Then found this site and because it was an Australian company with good reviews i thought i would give it a try. Definitely worth it! Received the samples so quickly and was so impressed with the quality. It didn't take long to make the decision to order this. The team are great and assist you with every question you have in ample time. I have already recommended the business to many of my friends and colleagues who have also begun to look at samples! Absolutely beautiful card! Ordered this as a sample and was blown away by the quality and lightning shipping.To be honest this website has such a beautiful selection of cards and invitations that I ordered so many samples and it was actually very hard to pick our favourite because they are all so beautiful and creative and the price is so reasonable and affordable!Thank you so much for your amazing service! 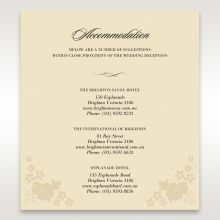 These invitations were absolutely beautiful and our guests loved the design. Thank you so much for doing such a wonderful job.